The branch of the Atcherley family tree which was based in the Shropshire parish of Kinnerley for many years began with Richard. This Richard Atcherley [ ] is a particularly perplexing piece in the family’s genealogical jigsaw puzzle, because I have no definitive evidence – in the form of a baptism or any other record – confirming the identity of his parents. I have provisionally placed him in the Atcherley tree as a son of John and Elizabeth (née Elsmere), although the evidence for this is circumstantial at best. Let’s review that evidence and take a closer look at Richard and his family. I’ll start by looking at what is known with a reasonable degree of certainty regarding Richard, his wife, and their children. On 16 October 1731, “Richard Acherley of ye pish of Stanton & Jane Davis, of ye pish of Kinnerley were marryed” at the church of Shrewsbury St Alkmund (pictured right). The parish referred to as Stanton was almost certainly Stanton on Hine Heath, situated to the north-east of Shrewsbury. Richard was most likely living at the tiny settlement of Sowbach, close to the parish’s border with Ercall Magna. Samuel Atcherley and wife Elizabeth had been resident there for a few years prior to their deaths (they were buried on 11 August 1731 and 5 September 1729 respectively), and one of the executors named in the will of Elizabeth (dated 21 June 1728) was “Mr Richard Atcherley of Sowbach” (see Samuel Atcherley’s true and perfect inventory – Part 1). Newlyweds Richard and Jane [ ] Atcherley settled in the bride’s parish, Kinnerley, and had two children there. “Elizabeth [ ] daughter of Richd Acherley de Edgerley”, was baptised at Kinnerley St Mary on 8 September 1732, and “Richard [ ] son of Richd. Atcherley of Edgerley” was baptised at the same place on 24 January 1733/4. Tragically, the next entry relating to this family which appeared in the Kinnerley parish register was for the burial of “Jane Wife of Richard Atcherley of Egerley” on 22 April 1736. It appears that Jane was just 24 years of age (or thereabouts), as I believe she was “Jane ye Daughter of Edward & Dorothy Davies of Sandford” who was baptised at West Felton in Shropshire on 31 May 1711. I was able to uncover Jane’s family connections thanks in part to two wills in which her children Elizabeth and Richard were named as benefactors. The first will, dated 4 May 1742 and proved 22 July 1742, was that of “Andrew Barnett [ ] of Oswestry in the County of Salop Apothecary”, who had several cousins with the surname Davies, as well as “Cozen Acherly of Egerly”. The second, proved 23 May 1748, was the will of Andrew’s mother “Jane Barnett [ ] of Measbury in the County of Salop Widow”. She made bequests to numerous relatives including “my cousins Richard Atcherley and Elizabeth Atcherley Son and Daughter of Richard Atcherley of Edgerley in the said Parish of Kynnerley”. Following up the leads in these wills with further genealogical research, I learned that Jane Barnett’s maiden name was Davies, and that she was an aunt of the Jane Davies who married Richard Atcherley. In her later years Widow Barnett share her home with her late niece’s mother, who had by that time been widowed, remarried, and widowed again, and was referred to in Jane’s will as “my Sister in Law Dorothy Clark of Maesbury who now lives with me”. If only I had sources like the above-mentioned wills which would allow me to pin down Richard Atcherley’s parentage so conclusively! Ownership of the Davies lands “in Kinerley” owned by Jane would have transferred to Richard Atcherley on his marriage to Jane in 1731. Were these lands situated at Edgerley, within Kinnerley parish, where Richard and Jane settled and had their children? Or were they in the township of Kinnerley itself? It is impossible to be certain, although I suspect that if they were at Edgerley then Edward Davies would have specified this in his will. Did Richard Atcherley therefore possess land at Kinnerley, via his wife, and property at Edgerley (by purchase or inheritance)? Richard and Jane’s daughter Elizabeth married Isaac Davies Jones [ ] of Oswestry at Shrewsbury St Chad on 1 September 1753. The marriage was by licence, which Isaac obtained after entering into a marriage bond in the sum of £100. According to the pedigree notes on the Atcherley family compiled by the Rev John Newling, Isaac was “commonly called Gentleman Jones”. Although the baptisms of his and Elizabeth’s children indicate that the couple lived in the parish of Kinnerley for several years after their marriage, “Isaac Davies Jones, gent.” was elected as a Burgess of Oswestry Town Council in 1754. He was evidently a ‘man of means’, but it seems that he lived beyond them: in 1761 he was imprisoned at Shrewsbury as a debtor! “Richard Atcherley of Edgerley Gent.” was buried at Kinnerley St Mary on 22 February 1766, leaving his son Richard junior to continue the Atcherley line there. His age at death was not recorded, but since centenarians were very uncommon back then I think it is safe to say that he was born no earlier than around 1670, and probably rather later than that. His marriage in 1731 suggests that his birth took place no later than about 1710. Richard Atcherley, baptised 1 October 1679 at Forden, Montgomeryshire. Son of Andrew Atcherley and Jane Lloyd. He is known to have married Elizabeth Lloyd at Battlefield, Shropshire, on 28 January 1702/3, by whom he had two sons, and he died on 11 May 1750. He was buried at Myddle on 15 May 1750 (see MIs at Myddle St Peter (1)). Richard Atcherley, baptised 26 March 1696 at West Felton, Shropshire. Son of Thomas Atcherley and Sarah Williams of Twyford. Most likely the Richard Atcherley of West Felton who married Susanna Morris in her home parish of Montford, Shropshire, 21 Feb 1725/6, and who then married Jane Edwards at St Martins, Shropshire, on 9 May 1737 before settling with her at Ebnal in the parish of Whittington, Shropshire, where the couple had four children. He was buried at Whittington on 8 May 1770. Richard Atcherley, baptised 5 April 1696 at Shrewsbury St Alkmund. Son of Thomas Atcherley and Jane Plymley of Shrewsbury (see Thomas and Jane Atcherley: Evidence of matrimony in a case at Chancery). I have no burial record for this Richard, but the Rev John Newling, in his pedigree notes on the Atcherley family, states that Richard was of London in 1719 and was later “lost at sea”. Richard Atcherley, baptised 30 October 1705 at Myddle. Son of the first Richard Atcherley in this list, and of Jane Atcherley née Lloyd. He died unmarried and without issue on 12 Apr 1766, and was buried at Myddle four days later (see MIs at Myddle St Peter (2)). Early 19th century sculpture depicting the baptism of a child. So the lives and deaths of all of the Richard Atcherleys in the list above seem to have been accounted for. It might be tempting to question whether the Rev John Newling was right about Richard of Shrewsbury (and later of London) being lost at sea. I don’t know the original source of John’s information, but he seems to have been well informed with regards to this Richard’s Atcherley’s family. They were definitely living in London at the time John placed Richard there (1719). He also added a comment which, if I have read it correctly, indicates that Richard was a ‘cousin’ of the Rev James Atcherley. I am therefore minded to accept John’s statement regarding Richard’s demise. With no baptism record for Richard Atcherley of Edgerley, the very basic family tree drawn by the Rev John Newling for Richard when compiling his Atcherley pedigree notes was separate from the others. My approach, as I indicated at the beginning of this article, has been to graft Richard’s branch onto a part of the tree where it seems to fit best. This is with the family of John and Elizabeth Atcherley of, well, of lots of places actually – including Edgerley. > On to Part 2. Picture credits. Shrewsbury St Alkmund: Cropped from a photo by San Sharma, taken from Wikimedia Commons and used, and made available for reuse, under a Creative Commons licence. Wills of Jane Barnett and Edward Davies: Embedded with code provided for the purpose by the National Library of Wales website. 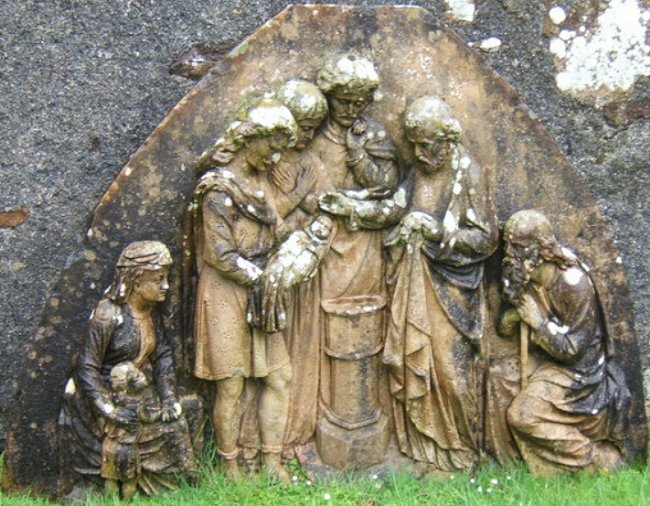 Early 19th century sculpture depicting the baptism of a child: Adapted from a photo © Copyright Barbara Carr; taken from Geograph and used, and made available for reuse, under a Creative Commons licence. Shrewsbury St Alkmund, Shropshire, parish register covering 1731. Entry dated 16 Oct 1731 for the marriage of “Richard Acherley” and Jane Davis. Copies viewed at Shropshire Archives and at Findmypast – Shropshire Marriages. Indexed at FamilySearch, Batch M03722-1, Film 510675 (names transcribed as Richard Ackerley and Jane Davies). Kinnerley, Shropshire, parish register covering 1732. Entry dated 8 Sep 1732 for baptism of Elizabeth Acherley. Copy viewed at Findmypast – Shropshire Baptisms. Abstract in Shropshire Parish Register Society (1913), Shropshire Parish Registers – Diocese of St Asaph, Volume III, Kinnerley, page 131; copies viewed at the Internet Archive website and Mel Lockie’s website. Indexed at FamilySearch, Batch P01544-1, Film 908230. Kinnerley, Shropshire, parish register covering 1733/4. Entry dated 24 Jan 1733/4 for baptism of Richard Atcherley. Copy viewed at Findmypast – Shropshire Baptisms. Abstract in Shropshire Parish Register Society (1913), Shropshire Parish Registers – Diocese of St Asaph, Volume III, Kinnerley, page 134; copies viewed at the Internet Archive website and Mel Lockie’s website. Indexed at FamilySearch, Batch P01544-1, Film 908230. Kinnerley, Shropshire, parish register covering 1736. Entry dated 22 Apr 1736 for burial of Jane Atcherley. Abstract in Shropshire Parish Register Society (1913), Shropshire Parish Registers – Diocese of St Asaph, Volume III, Kinnerley, page 138; copies viewed at the Internet Archive website and Mel Lockie’s website. West Felton, Shropshire, parish register covering 1711. Entry dated 31 May 1711 for baptism of Jane Davies. Copy viewed at Findmypast – Shropshire Baptisms. Llyfrgell Genedlaethol Cymru – The National Library of Wales. Andrew Barnett: will, 1742 (SA/1742/136). Copy viewed at National Library of Wales website. Shropshire Archives document reference 484/255 (system reference X484/1/13/4/255) dated 27 Apr 1743: Assignment [of a trust made in the will of Andrew Barnett]. Abstract at Discovering Shropshire’s History website. Llyfrgell Genedlaethol Cymru – The National Library of Wales. Jane Barnett: will, 1748 (SA/1748/132). Copy viewed at National Library of Wales website. Kinnerley, Shropshire, parish register covering 1724. Entry dated 16 Apr 1724 for marriage “Thomas Clark & the Widdow Davies both of this Prish”. Copy viewed at Findmypast – Shropshire Marriages. Abstract in Shropshire Parish Register Society (1913), Shropshire Parish Registers – Diocese of St Asaph, Volume III, Kinnerley, page 109; copies viewed at the Internet Archive website and Mel Lockie’s website. West Felton, Shropshire, parish register covering 1704. Entry dated 23 Apr 1704 for marriage of “Edward Davies & Dorithy Davies both of ye Townp. of Sandford”. Copy viewed at Findmypast – Shropshire Marriages. West Felton, Shropshire, parish register covering 1720. Entry dated 29 Jun 1720 for burial of Edward Davies. Copy viewed at Findmypast – Shropshire Burials. Llyfrgell Genedlaethol Cymru – The National Library of Wales. Edward Davies: will, 1720 (SA/1720/152 W). Copy viewed at National Library of Wales website. Shrewsbury St Chad, Shropshire, parish register covering 1753. Entry dated 1 Sep 1753 for the marriage of “Jones Isaac Davies & Elizth. Atcherley”. Copy viewed at Findmypast – Shropshire Marriages. Abstract in Shropshire Parish Register Society (1916), St Chad’s, Shrewsbury, Volume II, page 116; copy viewed at Mel Lockie’s website. Indexed at FamilySearch, Batch I04645-4, Film 1701330. Lichfield Record Office: Diocese of Lichfield and Coventry Marriage Allegations and Bonds, bond dated 29 Aug 1753 in respect of the marriage of Isaac Davies Jones of Oswestry and Elizabeth Atcherley of St Chad. Copy viewed at Findmypast – Staffordshire, Dioceses [sic] of Lichfield & Coventry marriage allegations and bonds, 1636-1893. Staffordshire Record Office item S. MS.256/8/5, undated, Pedigrees and genealogical notes from the collection of the Revd. John Newling for various families including Atcherley. Indexed at Gateway to the Past. Staffordshire Record Office item S. MS.269/1/14, undated, Pedigrees of families in Shropshire (etc) from the collection of the Revd. John Newling: Atcherley, co. Salop. Indexed at Gateway to the Past. Kinnerley, Shropshire, parish register covering 1754. Entry dated 22 Jul 1754 for baptisms of “Richard & Elizabeth Twins of Isaac Davies Jones of Dovaston”. Copy viewed at Findmypast – Shropshire Baptisms. Abstract in Shropshire Parish Register Society (1913), Shropshire Parish Registers – Diocese of St Asaph, Volume III, Kinnerley, page 166; copies viewed at the Internet Archive website and Mel Lockie’s website. Indexed at FamilySearch, Batch P01544-1, Film 908230. Kinnerley, Shropshire, parish register covering 1758. Entries dated 7 Feb 1757 for baptism of “Rebecca Daughter of Mr. Isaac Davies Jones of Kynaston” and burial of “Isaac Son of Mr. Isaac Davies Jones of Kynaston”. Copies viewed at Findmypast – Shropshire Baptisms / Shropshire Burials. Abstracts in Shropshire Parish Register Society (1913), Shropshire Parish Registers – Diocese of St Asaph, Volume III, Kinnerley, page 172; copies viewed at the Internet Archive website and Mel Lockie’s website. Baptism indexed at FamilySearch, Batch P01544-1, Film 908230. Kinnerley, Shropshire, parish register covering 1758. Entry dated 19 Nov 1758 for baptism of “Emma Daughter of Mr. Isaac D: Jones of Dovaston”. Copy viewed at Findmypast – Shropshire Baptisms. Abstract in Shropshire Parish Register Society (1913), Shropshire Parish Registers – Diocese of St Asaph, Volume III, Kinnerley, page 173; copies viewed at the Internet Archive website and Mel Lockie’s website. Indexed at FamilySearch, Batch P01544-1, Film 908230. Kinnerley, Shropshire, parish register covering 1760. Entry dated 27 Jul 1760 for baptism of “James Son of Isaac D: Jones of Dovaston”. Copy viewed at Findmypast – Shropshire Baptisms. Abstract in Shropshire Parish Register Society (1913), Shropshire Parish Registers – Diocese of St Asaph, Volume III, Kinnerley, page 177; copies viewed at the Internet Archive website and Mel Lockie’s website. Indexed at FamilySearch, Batch P01544-1, Film 908230. Oswestry Town Archives. Document OB/A8/61 dated 1 Mar 1754. Certificate of Election of Burgess for Isaac Davies Jones, gent. Indexed at Oswestry Town Council website and The National Archives website. London Gazette, 19 Sep 1761, issue 10141, page 5. Kinnerley, Shropshire, parish register covering 1766. Entry dated 22 Feb 1766 for burial of Richard Atcherley. Abstract in Shropshire Parish Register Society (1913), Shropshire Parish Registers – Diocese of St Asaph, Volume III, Kinnerley, page 188; copies viewed at the Internet Archive website and Mel Lockie’s website. West Felton, Shropshire, parish register covering 1696. Entry dated 26 Mar 1696 for baptism of “Richard ye son of Thomas Acherly & Sarah his wife of Twyford”. Original viewed at Shropshire Archives. Copy viewed at Findmypast – Shropshire Baptisms. Montford, Shropshire, parish register covering 1725/6. Entry dated 21 Feb 1725/6 for marriage of “Richardum Atcherly de West Felton et Susannum Morris de Ensdon”. Copy viewed at Findmypast – Shropshire Marriages. Abstract in: Shropshire Parish Register Society (1909), Shropshire Parish Registers –Diocese of Lichfield, Volume VII, Montford, page 43; copies viewed at the Internet Archive website and Mel Lockie’s website. Indexed at FamilySearch, Batch M01526-1, Film 0897302 IT 2, 503509. St Martins, Shropshire, parish register covering 1737. Entry dated 9 May 1737 for marriage of “Richard Acharlay & Jane Edwards”. Copy viewed at Findmypast – Shropshire Marriages. Abstract in Shropshire Parish Register Society (1898), Shropshire Parish Registers – Diocese of St. Asaph, Volume VIII, The Register of St Martins, page 195; copies viewed at the Internet Archive website and Mel Lockie’s website. Llyfrgell Genedlaethol Cymru – The National Library of Wales. Richard Atcherley: will, 1770 (SA/1770/128). Copy viewed at National Library of Wales website. Whittington, Shropshire, parish register covering 1770. Entry dated 8 May 1770 for burial of “Richard Atcherley of Ebnal”. Copy viewed at Findmypast – Shropshire Burials. Abstract in Shropshire Parish Register Society (1910), Shropshire Parish Registers – Diocese of St Asaph, Volume II, Whittington, page 548; copies viewed at the Internet Archive website and Mel Lockie’s website. Shrewsbury St Alkmund, Shropshire, parish register covering 1696. Entry dated 5 Apr 1696 for baptism of “Richard the sonn of Thomas Atcherley and Jane his wife”. Copy viewed at Findmypast – Shropshire Baptisms. Indexed at FamilySearch, Batch C03722-2, Film 510675.